I'll start by saying that God is amazing. He is clever. He is kind. His signs are without equal. This Blood Moon contained so many signs and so much information, I've had to condense a fair bit just to make this post readable in a single sitting. Even so, there's still a lot here, and even more you can discover on your own if you want to put in the effort. God is indeed speaking to the world through these signs, but He also wants to speak to you. Go to Him with your questions, and focus on recognizing His answers. He can and will teach you. Like the first Blood Moon, this moon appeared in the constellation Virgo, but this placement put the moon between the stars Spica and Porrima. Porrima is also a binary star and also happens to carry a Latin name; it is named for the ancient Roman goddess of prophecy, specifically dealing with the future. Virgo derives her name from Latin for “the virgin.” She is traditionally drawn with a sheaf of wheat in her hand, represented by the star Spica. 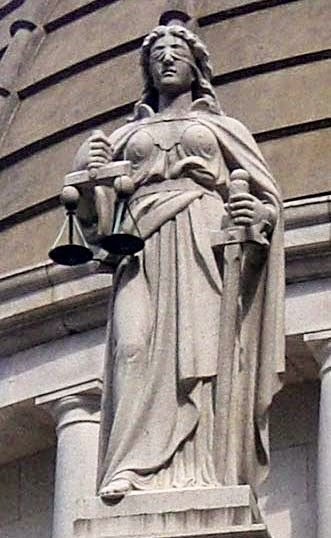 The virgin is sometimes portrayed holding the scales of justice in her other hand, represented by her neighboring constellation, Libra. Arcturus: The moon appears directly below Arcturus, which is the brightest star in the northern sky, and therefore usable for navigation. Arcturus is part of the constellation Boötes, and was anciently associated with Enlil, the Sumerian God of breath, wind, loft and breadth (height and distance). 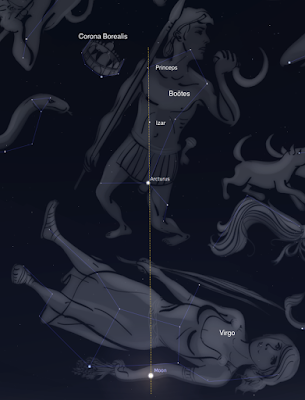 Boötes: This constellation represents the plowman, plowing the field, making it ready to sow. Izar: This binary star in Boötes carries the Arabic name for "veil." Princeps: This binary star in Boötes carries the Latin name for "prime" or "prince." Corona Borealis: The “northern crown,” representing a crown or diadem. 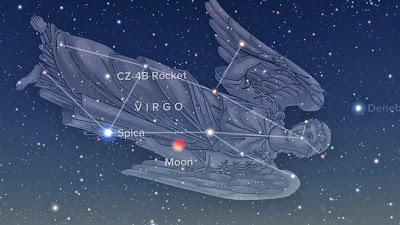 This is the second Blood Moon of this tetrad to appear in Virgo, serving as a second witness and second warning of what the Lord has underway. God follows the law of witnesses. As we've mentioned, Virgo is often portrayed with wheat in one hand. But she is also anciently identified as the virgin goddess Iustitia or Astraea, who is portrayed with the scales of justice (Libra) in one hand. And what's in the other hand? He's pointed to Virgo twice. The warning should be clear. 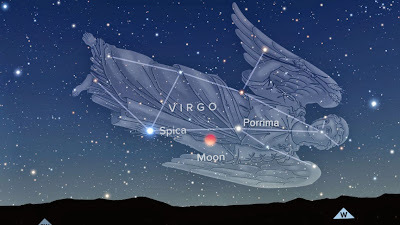 As you may recall, the first Blood Moon in Virgo touched Spica, reminding us of the Lord’s promise to gather the wheat from among the tares before the destruction and burning. It also reminded us of the prophesied Gentile destruction. This second witness Blood Moon gives greater context and depth to these ideas with much more detailed information. Notice the moon in this appearance moves closer to Porrima, representing prophecy, and turning our minds to events long prophesied...by Isaiah. Oh no! Isaiah AND Astronomy? So yes, it is possible to examine both Isaiah and astronomy, and with the Lord's help, gain some understanding of the things He wants us to know. Stick with me and I'll show you what I mean. Woe to the crown of pride, to the drunkards of Ephraim, whose glorious beauty is a fading flower, which are on the head of the fat valleys of them that are overcome with wine! (v.1). Confused already? Don't be. The opening of Isaiah 28 is actually a warning to the self-aggrandized and opulent leaders of "Ephraim." The warning, then, is directed against those who stand at the head of Ephraim, claiming to be prophets and seers, but who actually stumble and err, glorying in the works of their predecessors, while teaching falsehoods, unable to receive revelation. Ironic that this sign was given on the first day of General Conference. This brings to mind Paul's metaphor, and the need to move on from milk to meat. Are you one whom the Lord can teach knowledge and doctrine? Are you weaned from milk? Do you seek to understand the mysteries of God? The wheat will be separated from the other plants, and planted in its prepared place. This is how the foundation of Zion will be laid. The destruction is coming. The warnings have been written overhead. The reference to mount Perazim harks back to the events of Exodus, when the Lord's people rejected what He offered, chose instead to "follow the prophet" and therefore lost the fulness of the Priesthood. (D&C 84:23-27) We are in exactly the same predicament today. What could be more strange than the idea that the Lord's own church, the one He established through the Prophet Joseph Smith, the one which He founded on revelation, and to which He gave the Book of Mormon, should turn away from Him and instead insist upon loyalty to men, belief in false precepts, and denial of gospel truths? How strange it is that the church bearing Christ's own name now casts out those who actually know Christ or seek to do so! How strange it is to insist that men who never prophesy are prophets, even with Christ's own words ringing in our ears: By their fruits ye shall know them! The Lord's work is a strange work indeed, which points us back to the drunkards of Ephraim—the false prophets, and their fading glory. In matters like these, I don't believe in coincidence. Therefore, I'll present one more sign found in the third Blood Moon: A man-made satellite, or more particularly a spent rocket booster from a CZ-4B rocket, flew directly through Virgo during the extremely brief total eclipse. The transit of Virgo took only two minutes, but those two minutes fell right in the middle of the total eclipse, which itself lasted less than five minutes. The timing was exquisite. 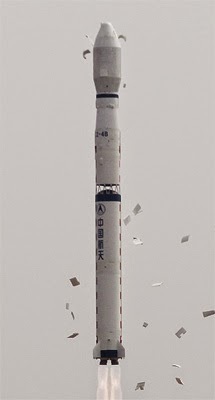 This booster was a spent piece of a Chinese rocket, known as a Chang Zheng, which translates as "Long March." The Long March name commemorates a forced march-retreat of several thousand miles during the Chinese communist revolution, which solidified the communists in power and propelled Mao Zedong to rule China for nearly 30 years. Even today, the Chinese communist party recognizes the difficult Long March as one of the most heroic acts of its forbears, and commemorates the event with parades, celebrations, and re-enactments. Similarly, the drunkards of Ephraim recognize the forced retreat from Nauvoo and the resulting difficult, long march to the Salt Lake Valley as one of the great, heroic acts of their forbears. The proud descendants of Nauvoo continually commemorate this march with parades, celebrations and re-enactments. This event propelled Brigham Young into his 30-year reign as President of the church. But the glory fades. New revelation all but ceased with Joseph. The heroic acts belong to years past. The church today is a powerful, wealthy, bureaucratic, politico-corporate entity run by business interests, selling a product called "the gospel," and spending massive wealth on commercial interests, as well as hundreds of opulent temples—using access to these temples as a means to control members. God, who knows the end from the beginning, placed the signs overhead. Fallen man, filled with pride, points to his own accomplishments. But while God's testimony will remain, man's satellite will fall. And thus it is foolishness to point to the accomplishments of our ancestors as if they could help our current situation. O ye wicked and perverse and stiffnecked people, why have ye built up churches unto yourselves to get gain? Why have ye transfigured the holy word of God, that ye might bring damnation upon your souls? Behold, look ye unto the revelations of God; for behold, the time cometh at that day when all these things must be fulfilled. Behold, the Lord hath shown unto me great and marvelous things concerning that which must shortly come, at that day when these things shall come forth among you. How many holy churches of God are there? If you claim it's the LDS church, then you admit it is polluted. If you claim it is not the LDS church, then there's no point in defending it. And yet, there is hope. With all these dire warnings overhead, let's not lose sight of the hope offered in Christ. We can repent. We can seek his face. We can rise up. The Lord is warning us because He loves us, and even in His urgent warnings He has offered a symbolic path to redemption. Arcturus is the brightest star in the Northern sky. Izar means "veil." Princeps means "prince." And, just to the left, Corona Borealis is a crown. And thus we see, there is a pathway laid out in a straight course before us if we will rise up. If we look to the heavenly light of the brightest star, we can rise up the straight path through Arcturus, pass through the "veil" and meet the "prince" who waits for us on the other side of the veil with a crown of righteousness. This is not a warning; it is an invitation. Christ is the Prince and He wants us to come to Him. There is a reason that astrology, numerology, and alchemy are discredited. And yet, God has made it abundantly clear in scripture that the lights in the heavens are there for signs. He calls them ordinances. He personally taught Abraham astronomy through the Urim and Thummim. We can choose to ignore what He has written in the heavens, using whatever excuses are convenient, or we can attempt to understand it. Your choice. Feel free to reject my interpretation if you disagree. I encourage you to go to God and scripture and work it out for yourself. And if they have truth in them, then the reason is bogus. The fact that people reject subjects may say more about the people than the subjects. Good catch. I made the correction. Thanks! Where do you get this stuff because I know you're not this smart. Must be revelation or something. Thank you so much for these posts. We live in very interesting and exciting times! Adrian, are you planning to post your remarks from the reunion? Many were unable to attend. Hi Kathy, I'm not sure yet what form that will take. I touched on a number of topics that each could be a post, and my talk is not written. It was just in outline form. I think I'll be posting on those topics and fleshing them out a bit more than I was able to do when I spoke. Adrian, could you post the audio (I assume you recorded it)? Sorry, I didn't record it. I don't know if anyone else did, but if someone did, I'll see what I can do. That is too bad about your reunion account. I hope someone recorded it.